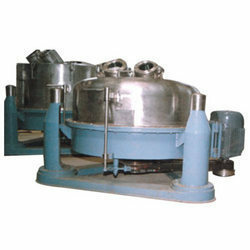 We are giving our client a wide range of Chemical Centrifuge. TMSS Dalfab Engineers Pvt. Ltd. Incorporated in the year 2014, in Vadodara (Gujarat, India), we “TMSS Dalfab Engineers Pvt. Ltd.”, are the distinguished Manufacturer and Supplier of an enhanced quality Decatising Machine, Fiber Stamping Machine and Chemical Plant Equipment. The offered products are precisely manufactured by making use of optimum grade material with the help of cutting-edge techniques. These products are widely demanded in number of industries such as textile, chemical, construction, manufacturing and many others for various purposes. Our offered products are stringently checked on series of quality parameters before being supplied to our clients. We offer these products to our clients in different technical specifications as per the information laid down by them. These products are widely appreciated by our clients for their enormous features such as sturdy construction, easy to handle, simple mounting, noiseless operations, long service life, non corrosive and durability. Apart from this, we also provide Custom Fabrication Service and Chemical Equipment Maintenance Service to various industries in cost effective manner as per their necessities.